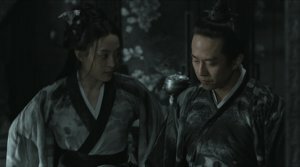 Review: Zhang Yimou is one of those few directors who manage to let visuals and narrative depth work for them on an equally high level. Ever since "Hero" this is a well-known fact, even beyond China's borders. After that he managed to deliver a few more neat movies, but the quality of his work kind of went downhill. The sad low point was the Matt Damon flick "The Great Wall". With "Shadow", though, a movie sneaks up on you, which shows Zhang at his best again. This even starts with his breathtaking visuals. Everything looks like a Chinese ink painting. The sets and costumes, everything is kept in black and white, even though the movie was shot in color. Therefore, the nuances of the skin colors and the blood stand in stark contrast to everything else. Next to the images, the cleverly designed story, in which nothing is as it seems while revolving around a tragic hero, manages to captivate you, too. In its core, "Shadow" seems to be a relatively slow-paced movie, but in fact, this is only true at first glance. The dialogues are constantly full of hints and oftentimes words can easily be as dangerous as a well-aimed sword attack. Political intrigues are the order of the day and it proves to be pretty thrilling to find out which agendas all the different parties actually have. 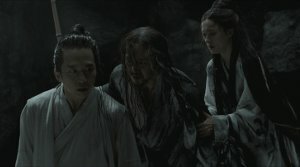 In the center, there is Yu and his "shadow", both played by Deng Chao ("The Mermaid"). Deng gives an outstanding and nuanced performance. After all, Yu's shadow is not just a brilliant martial artist, but also a self-confident commander, who oftentimes talks back at the king. But in reality, he is plagued by his longing after a home and his unrealizable love for Yu's wife. 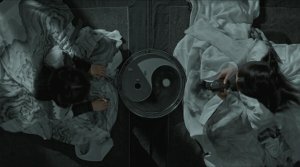 This contrast between strength and weakness is another version of the movie's central motive of yin and yang. 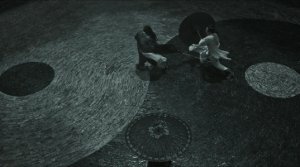 Yu, who withdrew into a cave-like hiding place, painted a big yin and yang symbol on the ground. 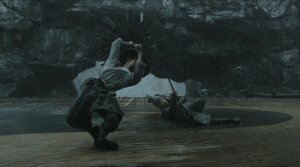 The monochromatic images make this motive stand out even visually, and the solution on how to defeat general Yang, also lies hidden in this motive. It is the wife who - armed with an umbrella - suggests to counter the strong yang of the same-named general with a female yin. Therefore, Yu's and his soldiers' chosen weapon proves to be an umbrella made out of sharp blades. So clearly, there is no lack in creativity here. And when we get to the fights, they manage to depict poetic beauty and merciless rigor at the same time. 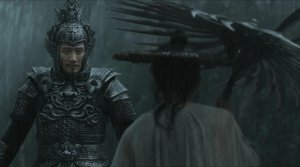 "Shadow" does not try to be particularly bloody, but as soon as we get to the battles, which are for mere survival, Zhang Yimou does not sugarcoat anything, so that there are some rather red-colored scenes as well. 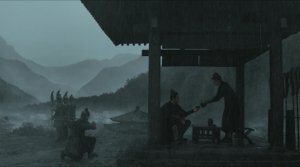 This atmosphere of both tranquility and tension is also mirrored by the rain lasting for days. The scenes in front of the palace are majestic and the palace's interior enchants us with folding screens full of drawings and calligraphy as well as wonderful costumes. 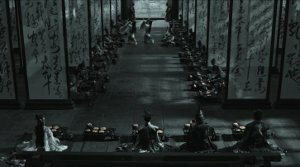 This strongly visually driven story is accentuated with a score by Lao Zai, aka Loudboy, in which the Guqin (a Chinese zither) stands out. This instrument is actually part of a duet between the real Yu and his wife and turns out to be a fight between the two. In this duet the wife accuses her husband of letting her live with another man as well as treating him badly. The husband, on the other hand, accuses her of having feelings for this man. But all this is just conveyed by touching some strings. 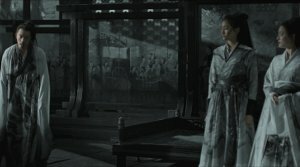 It is this kind of subtle storytelling which makes Zhang Yimou one of the best Chinese directors. The characters in "Shadow" were written very nuanced, and the actors all work on such a high level that they manage to be up to par with the script. Even the minor parts, like the wife played by Sun Li ("Fearless"), were cast very well and make you easily delve into the subplots, which in the end turn out to be just branches of the main plot, anyway. Palace intrigues may sometimes be pretty tiresome, but "Shadow" manages to offer something new at all times. Towards the end, there are also some twists and enough action scenes to boost the suspense. But "Shadow" is most interesting when it tells its story through the dialogues and the subtle acting. In those moments, the suspense is almost palpable and the strengths of Zhang's wonderful images can be shown off the best. A small masterpiece by Zhang Yimou, which was long overdue.